Ecoflex® rubbers are platinum-catalyzed silicones that are versatile and easy to use. 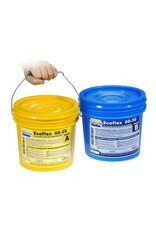 Ecoflex® rubbers are mixed 1A:1B by weight or volume and cured at room temperature with negligible shrinkage. Low viscosity ensures easy mixing and de-airing, or you can choose to mix and dispense using our convenient dispensing cartridges. Cured material is skin safe and certified by an independent laboratory to ISO 10993-10, Biological evaluation of medical devices, Part 10: Tests for irritation and skin sensitization. Cured rubber is very soft, very strong and very “stretchy”, stretching many times its original size without tearing and will rebound to its original form without distortion. Ecoflex® rubbers are water white translucent and can be color pigmented with Silc Pig® pigments for creating a variety of color effects. You can also add Smooth-On’s Silicone Thinner® to further lower the viscosity. 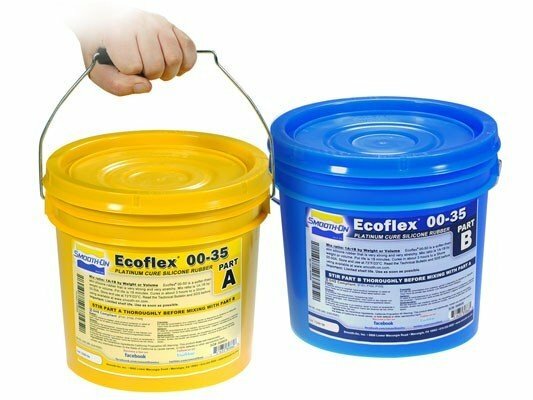 THI-VEX® silicone thickener can be added by weight to Ecoflex® silicones for brushable aplications. Soft, Softer, Softest . . . Ecoflex® rubbers are based on Smooth-On’s Dragon Skin® technology and are currently available in four different hardness’: Shore A-5, Shore 00-10, 00-20, 00-30 and 00-50. They are suitable for a variety of applications including making prosthetic appliances, cushioning for orthotics and special effects applications (especially in animatronics where repetitive motion is required).